Drug proof disputed - Patrick C. Fagan, Q.C. The Crown may have bundles of seized cocaine, but it has no evidence to prove a suspected drug smuggler was waiting for its arrival, a defence lawyer argued yesterday. “A lot of dope, no evidence,” Pat Fagan said in summing up the prosecution case against his client. 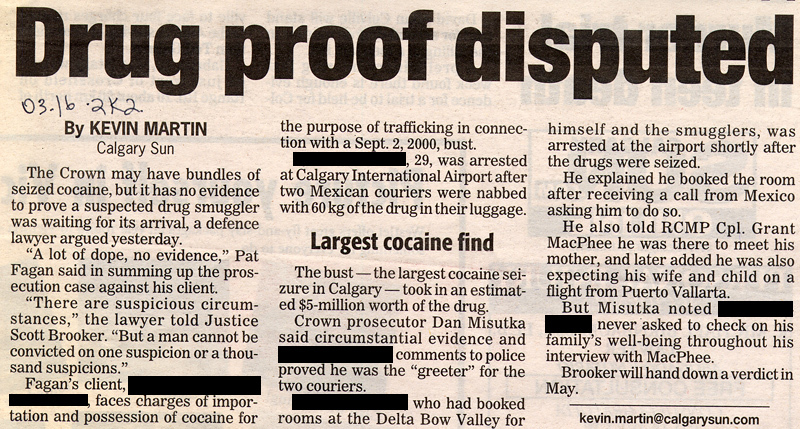 Fagan’s client faces charges of importation and possession of cocaine for the purpose of trafficking in connection with a Sept. 2, 2000, bust. The accused, 29, was arrested at Calgary International Airport after two Mexican couriers were nabbed with 60kg of the drug in their luggage. The bust — the largest cocaine seizure in Calgary — took in an estimated $5-million worth of the drug. Crown prosecutor Dan Misutka said circumstantial evidence and the accused’ comments to police proved he was the “greeter” for the two couriers. The accused, who had booked rooms at the Delta Bow Valley for himself and the smugglers, was arrested at the airport shortly after the drugs were seized. He explained he booked the room after receiving a call from Mexico asking him to do so. He also told RCMP Cpl. Grant MacPhee he was there to meet his mother, and later added that he was expecting his wife and child on a flight from Puerto Vallarta. But Misutka noted the accused never asked to check on his family’s well-being throughout his interview with MacPhee. Brooker will hand down a verdict in May.